I am ready to come out from hibernation. The crocuses in the yard have bloomed, garlic is starting to emerge from the ground along with the hyacinths, tulips, and daffodils, and I've got vegetable garden seeds just beginning to sprout. All this green emerging around me has me inspired in the kitchen. I'm itching to sip weekend brunch/lunch cocktails on the patio. 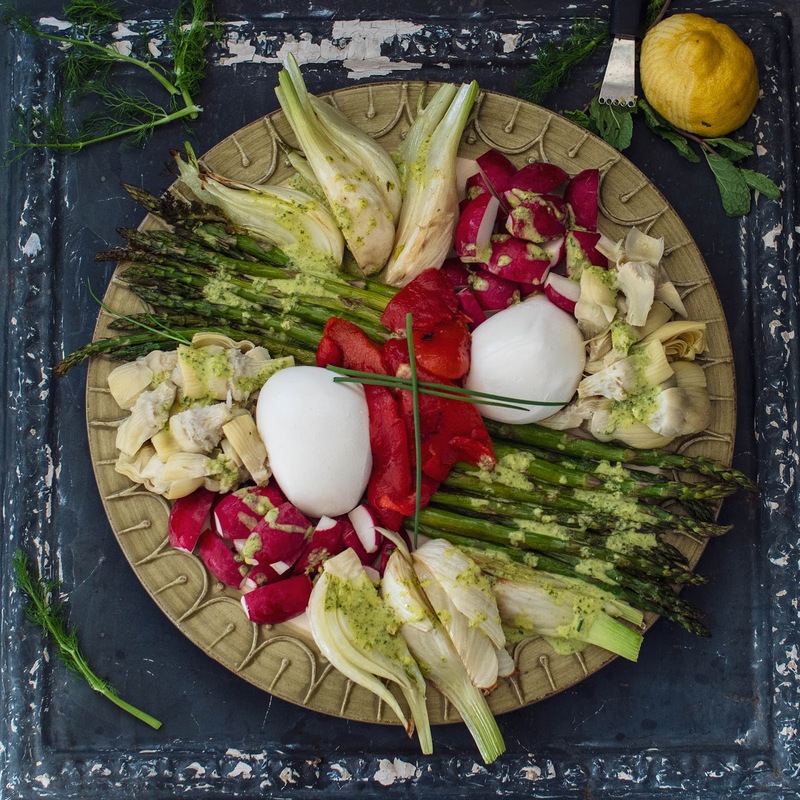 This vegetarian-friendly antipasto featuring burrata from Calabro Cheese is helping get me in the mood for Spring get-togethers and holiday celebrations. In my book when a cheese company wants to collaborate, you just say yes. I've partnered with Calabro in the past and this time I was extra excited because, hello, burrata! Calabro's hand made Burrata of Bufala is made every day from fresh bufala milk. This artisan ball is stretched into a delicate veiled shell and filled with stracciatella (hand pulled strands of bufala mozzarella”) and sweet bufala cream. It's a thing of beauty - elegant, and delicious. Antipasto is the perfect way to enjoy it. Just surround it with fresh, grilled, or roasted vegetables, drizzle a Spring herb dressing over the top, and dig in. Other than greenhouse greens and some herbs there isn't much fresh local produce right now. So, yes, most of the vegetables came from the supermarket. It is what it is; I can only survive on preserved, frozen, or over-wintered options for so long. The herbs are all mine though. I was more than a little excited to snip the chives from the patio garden bed. 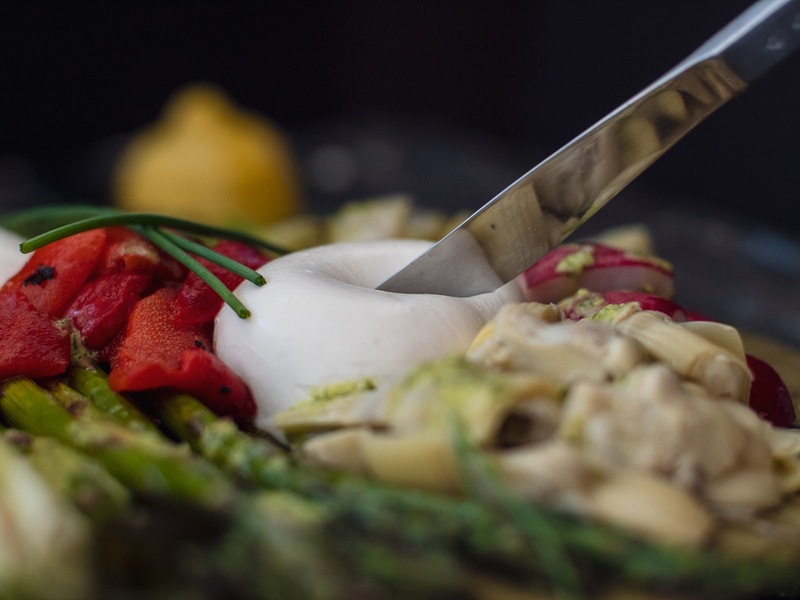 In addition to the burrata (truly the focal point), this vegetarian antipasto features a few Italian antipasto classics: roasted red peppers, artichoke hearts, and fennel. I added asparagus because even though it's too early to get locally-grown, I associate it with Spring. I roasted both the asparagus and the fennel. I just like roasted asparagus, especially when the tips get a little crispy. Raw fennel, with its intense licorice flavor, can be a tad overpowering. I find that roasting mellows out the licorice-ness (probably not a real word) and helps develop a bit of sweetness. By roasting it, it played better with its fellow antipasto platter mates. Then, I drizzled a vinaigrette over the top of everything. To me, lemon is made for Spring dishes; so for the dressing, I blended together some lemon zest and juice, champagne vinegar, extra virgin olive oil, chives, and mint. It perfectly tied together all the vegetable elements, which can be "bland" on their own. Serve as a start to your Spring party or enjoy it as a meal in and of itself. Either way, you'll be fighting each other for the last bite of burrata. Trimmed the cut ends of asparagus. Toss the asparagus spears in 1 tablespoon of olive oil. Salt to taste. Place onto a rimmed baking sheet. Roast for 15 minutes. Remove from oven and set aside. Prep the fennel. Trim off the top (fronds) of the fennel bulb. Cut the bulb into eighths, keeping the core intact. salt to taste. Toss the pieces with 1 tablespoon of olive oil and place on a rimmed baking sheet. Roast for 12 minutes, flipping the pieces halfway through cooking. Remove from oven and set aside. In a blender or mini food processor blend together 2 tablespoons extra virgin olive oil, lemon zest, lemon juice, champagne vinegar, chives, and mint. Season with salt to taste. On a large platter arrange the asparagus spears, roasted fennel around the two pieces of burrata. 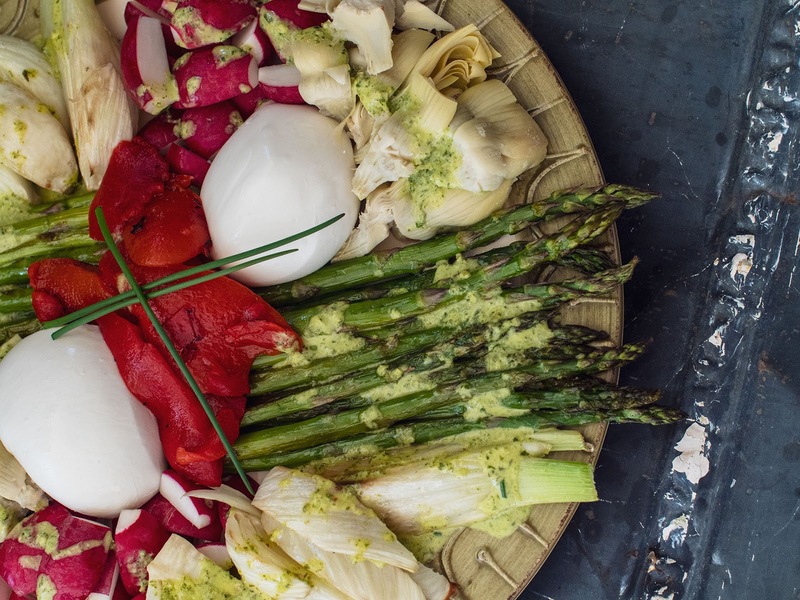 Fill in the rest of the platter with the artichoke hearts, roasted red peppers, and radish pieces. Drizzle the lemon vinaigrette over the top of everything and serve. Would go well with garlic bread.